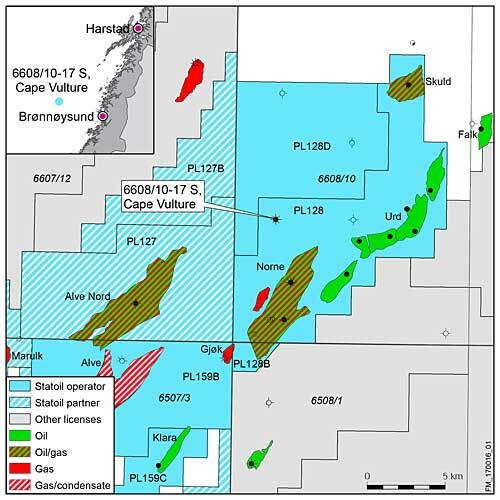 Statoil reports that 1 year after the licence award an oil and gas discovery has been made close to Norne estimated at between 20 and 80 million barrels. “It’s great kicking off the new year with a discovery,” says Jez Averty, senior vice president for exploration in Norway and the UK. The drilling of the Cape Vulture exploration well started in early December 2016. The well was drilled in the license 128 as a result of the award of license 128D in the APA round in 2015 (Award in Predefined Areas). 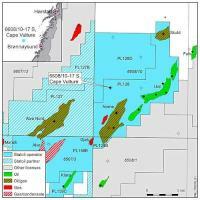 The drilling of the well is the result of the development of a new exploration concept for the Nordland Ridge. “We make this discovery one year after the announcement of the licence award at the 2016 Sandefjord conference. We are satisfied with already completing the well and happy to be able to announce Cape Vulture as a commercial discovery. This shows the importance of new acreage, demonstrates our ability to quickly test new opportunities, and emphasises that looking at mature areas in new ways may pay off,” Averty adds. The Cape Vulture discovery opens up for further exploration opportunities in the area. Statoil will now analyse the results in detail, and identify any new exploration targets in the area. Recoverable reserves are initially estimated at between 20 and 80 million barrels of recoverable oil equivalents and plans for further appraisal of the discovery will be made. Located north-west of Norne, a tie-back of the discovery to the FPSO at the Norne field will be considered. “We are very pleased with this discovery”, says Siri Kindem, Statoil’s senior vice president for Operations North. “Norne is already a much greater success than we expected when the field was discovered. It has been the backbone of our ventures in the north from the very beginning and discoveries such Cape Vulture contribute to Norne’s long life, and to maintaining activities in the Norwegian Sea,” Kindem adds. “Statoil has a 40-year presence in the north, and we continue to be the driving force in the oil and gas industry here,” Kindem says. Statoil is the operator of license 128 and 128D with a 64 % share, Petoro holds a 24.5 % share and ENI a 11.5 % share.